There is a balance to be mae between making sure you use imagery to tell your story whilst respecting pupil’s rights and adhering to legislation However, a foo though-through and up to date policy share by all stakeholders will free you up and give you confidence. Schools, clubs and organisations should develop a photography policy to use for images of children and young people that are going to be used in publications, websites and social networking sites. The policy can also be used to help children, parents, staff and volunteers understand how photographs can be shared more safely. Are there any technical things you should let the photographer know about (ie if you are having the images printed big, or if for a website)? It is best to check with your designers/printers first about what they need, you could ideally just put the photographer and designer in touch so you don’t get to caught up in the technical bit! So long as this information is shared and expectations are clear. Plan the time carefully. Of course, this is particularly important in an education environment, which is primarily about the experience for the child/young person. Provide the timings for anything happening whilst the commission is taking place. Once you have an established relationship with your photographer, this will become less important – but it is always helpful. Show samples of any images that you do and don’t like. The more you can describe what you want out of the commission, the better – include a Branding Guidelines document too if appropriate. Share the Brief where appropriate – let everyone involved know it’s happening and what to expect. There should always be someone as a point of contact. or if there are a few pupils the cannot be photographed, go round with them to assist. Write a list of the shots you would like – doesn’t have to be exhaustive of course as sometimes the best images just ‘happen’ during the shoot. However, make sure you put down anything you really do need. When do want them by? Very important; we tend to send over edited images within 24 hours, but many companies have a longer turn-round, so be sure to know what you need and by when. For example, you may want a selection of images for social media asap. How do you want to receive them? We send images to our clients usually via We Transfer, or Dropbox Whichever method you choose, remember SECURITY of transfer and also how you and your photographer store the images. Your relationship with your photographer should be a really positive experience. If it isn’t, or your photographer is too intrusive, takes up too much time, doesn’t deliver, or doesn’t keep a smile on their face – find someone else! There is a knack to writing a good press release but don’t be scared by it if it is not in your comfort zone. Professionals like us can help. ‘Turn-round’ – just an informal term for the time it takes a photographer to get back to their desk, download the images to their computer, edit the best, caption them [the information ‘behind’ the image that shows up on social media and for picture desks in the media] and send them to their client. 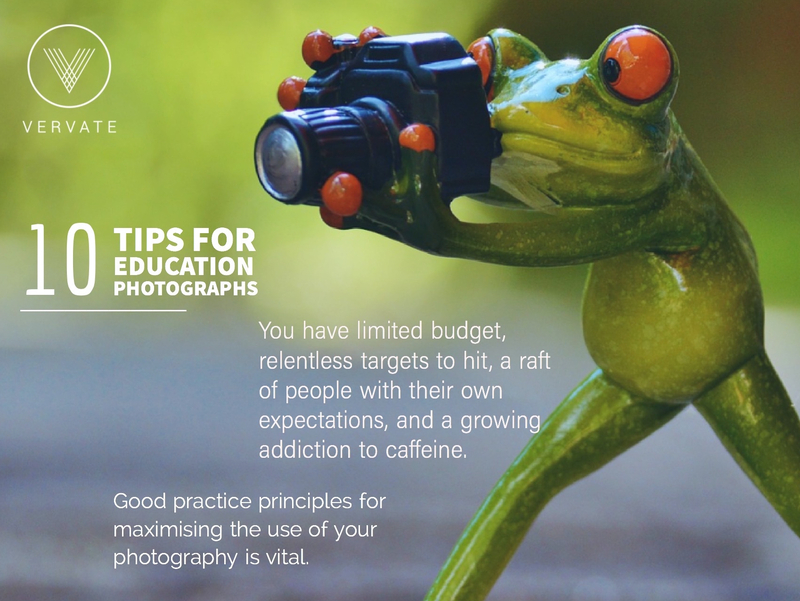 We have developed this Brief after years of experience of commissioning photographers and following Photography Briefs. Please do let us know how you get on with these and if you found anything useful or something that would help. We know how to tell your story with images, we listen, we have VERVATE DBS (enhanced) certificates and we love working in education. If you need more information or a chat about where you are at with using photographs at your education establishment then give us a shout.